IBA: GR 104 MOUNT OITI. The site was designated as “National Forest Park of Mt. Oiti (Ethnikos Drymos Oitis)” by Royal Decree 218/7.3.1966 (Government Gazette 56/12.3.1966). The National Park of Mt. Oiti consists of the core strict nature protection zone (3,370 ha) and the peripheral zone (3,630 ha). The borders of the Natura 2000 SPA site coincide with the borders of the peripheral zone. Part of the site interlaps with the Wildlife Refuge “Skasmeni Frantzi-Dyo Vounon” (Law No 177/75 as amended by Law No 2637/98). The site falls under public ownership. Land uses in the strictly protected core zone are restricted; all agricultural, silvicultural, livestock farming, game, and building activities are prohibited. Livestock farming is allowed throughout the peripheral zone and logging is permitted in a small area on the western part of the peripheral zone around the Community of Kastania. The National Park of Mt. Oiti extends at altitudes of 400 – 2,116 metres and includes most of the highest peaks of the mountain (except the highest, Pyrgos, at 2,152 m). The parent rock material of a large part of the site is limestone, but there are also large areas of flysch. Karst formations of great aesthetic value are widespread in the site. An important element of Mt. Oiti is the large number of streams, occurring mostly on its northern side, which feed the river Spercheios and irrigate the area. The vegetation growing on the limestones of the lower altitudes, up to 800 m, is characterised by evergreen sclerophyllous shrubs (habitat type 9320, Oleo-Lentiscetum aegeicum) and by a zone of Quercus ilex forest (habitat type 9340, Andrachno-Quercetum ilicis). Also, at the eastern part of the site there is a small patch of dense Quercus frainetto forest (Querco cocciferae-Phillyreetum latifoliae). Narrow stands of Oriental plane (Platanus orientalis) (habitat type 92C0) develop along many of the streams. The vegetation of the higher altitudes (700–1,950 m) is dominated by forests of the endemic Greek Fir (Abies cephalonica). The fir forests grow on limestone or on flysch, and are generally dense (mean cover 80%). Pinus nigra subsp. pallasiana (habitat type 9530*) forms a small natural forest on the northern slopes of the site (1,150–1,350 m). Juniperus foetidissima (habitat type 9560*) forms two low-cover, thin stands on steep limestone slopes at the eastern part of the site. Heaths with dense and low Juniperus communis subsp. nana (habitat type 4060) develop at the outskirts of the fir forest on flysch. Regeneration of the fir is frequently observed within the shrubs. Endemic oro-Mediterranean heaths with gorse (habitat type 4090) cover large areas of forest openings, and above the tree line (altitudes of 1,200–2,000 m) on flysch. They are characterised by thick prostrate shrubs and subshrubs such as Astragalus thracicus subsp. parnassi, Marubium velutinum, Daphne oleoides, Astragalus semprevirens, and Acantholimon androsaceum. This type of heath has evolved in parallel with sheep and goat grazing, which used to be intense. Grasslands with Nardus stricta - Alopecurus gerardii (habitat type 6230*) are abundant at forest openings and plateaus at altitudes above 1,000 m, on flysch. Eutrophic tall grasslands with Juncus effuscus (habitat type 6430) develop above 1,400 m at wet sites. Small Mediterranean temporary ponds (habitat type 3170*) with Corrigiola litoralis, Ranunculus lateriflorus and Myosurus minimus occur at Leivadies, the central plateau of the site, and at a small plateau in the area of Louka. Chasmophytic vegetation (habitat type 8210), characterised by the participation of many endemic species, develops mainly on the steep limestone slopes of the northern part of the site. Typical limestone scree vegetation is rare in the site and restricted in a small area of its central part. The flora of the site includes more than 1,000 taxa. The Mediterranean and Balkan elements are dominant in the flora and 79 Greek endemic plants occur here. In total, the endemic, rare/threatened, and protected flora species, which are important for diversity, number 140: approximately 90 of them occur in grasslands or forest openings, while 10 of them are restricted to forests. The fauna of the site has not been studied in detail. According to the Management Plan for the National Park of Mt. Oiti (LIFE92 NAT/GR/013700), the fauna includes 166 species of birds, 59 species of mammals, 43 species of amphibians and reptiles, 12 species of fish (data refer to the greater area of Mt. Oiti including the surrounding lowlands, so the number within the National Park may be smaller). The distribution of the larger fauna groups in habitats is shown in table 1 (attached). In the greater area of Mt. Oiti there are several archaeological and cultural sites. Within the site of the National Park, there are ruins of ancient ramparts (location Aetos) and the Monastery of Agathonas, dating back to the 12th century. In the complex of the Agathonas Monastery there is a small Natural History Museum, which provides basic information on the wildlife of Mt. Oiti. The National Park of Mt. Oiti is characterised by geological and geomorphological variety, it has abundant water sources, and it is located at the transition zone between Northern and Southern Greece. It is important for biodiversity at the national level because it includes a variety of extensive natural and semi-natural habitats, with excellent representation (the most important being Greek Fir forests). It also hosts a large number of flora and fauna species, some of them rare, and is the southernmost limit of the distribution of several species such as Caltha palustris. It is also important for biodiversity at the European level and for this reason it has been designated as a European Council Biogenetic Reserve. Habitats: A total of 13 habitat types of Annex I Dir. 92/43/EEC have been recorded in the site: 4 of them priority ones (3170*, 6230*, 9530*, 9560*). The Mediterranean temporary ponds (3170*) are extremely important at both national and regional level. This habitat type has been recorded in only 33 Natura 2000 sites in Greece: 24 of them in the Aegean and only 9 in mainland Greece. Moreover, the ponds of the site, along with those of Mt. Kallidromo, are the only ones recorded in high altitudes on mainland Greece (another two high altitude sites exist in Crete). It must be noted that this habitat may occur in more sites in mainland Greece, but there are no confirmed records. The ponds of Mt. Oiti host some specialised and very rare in Greece plant species: Myosurus minimus occurs in only 5–6 locations in Greece (it is rare at the SE Mediterranean level) and Mt. Oiti is the sole mainland Greece location where its presence has been recently confirmed; Ranunculus lateriflorus occurs in only 5–6 locations in Greece; and Veronica oetaea is endemic to the site (see below). 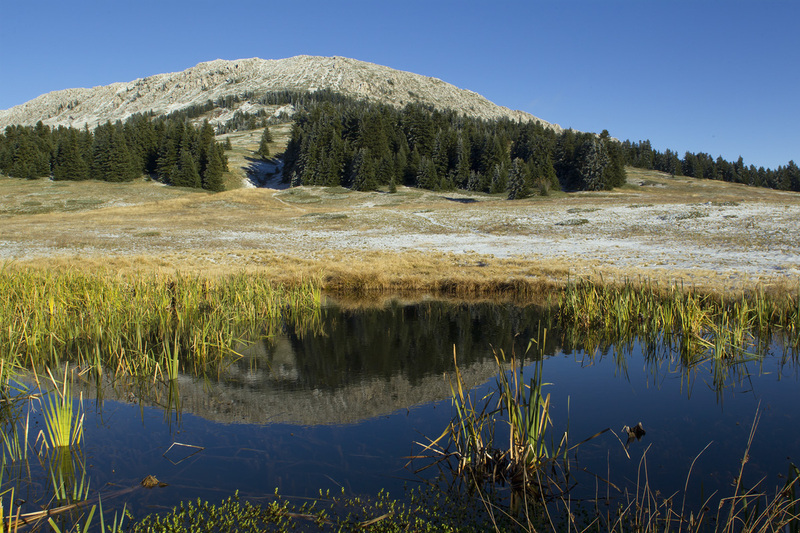 Moreover, the ponds are the habitat of the Annex II 92/43/EEC species Yellow-bellied Toad (Bombina variegata), and of two species protected by the Bern Convention: the Alpine Newt (Ichtyosaura alpestris) and Green Toad (Bufo viridis). In addition, the site is one of the only 9 Natura 2000 sites in Greece where the habitat type 9560* “endemic Mediterranean forests with Juniperus spp.” has been recorded. The Juniperus foetidissima forests develop only in the Balkan Peninsula and Cyprus in the EU. 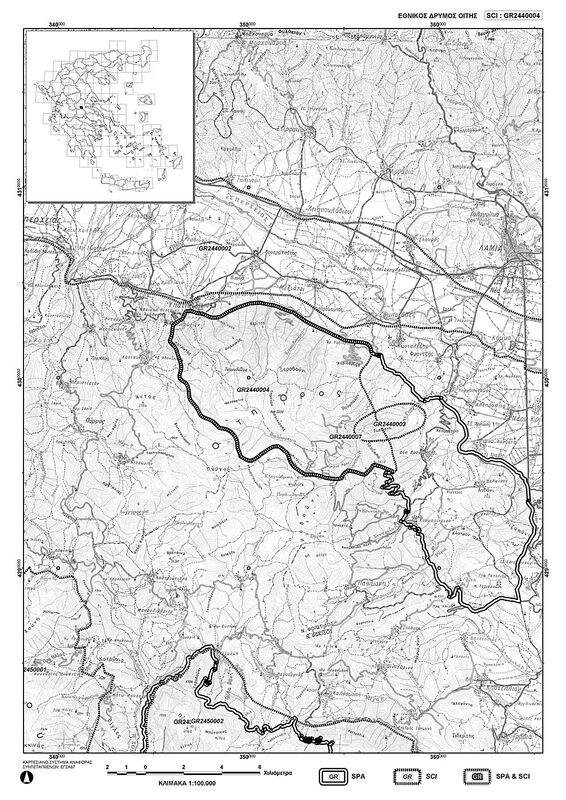 Habitat type 6230* “Species-rich Nardus grasslands, on siliceous substrates in mountain areas” has been recorded in 24 of the Natura 2000 sites in Greece and the communities of Mt. Oiti are among the most representative. Flora: It includes 32 taxa that are rare or threatened in Greece: 17 of them are Greek endemics. Of the endemic taxa, 10 are restricted to the region of Sterea Ellada and three are narrow endemics: Veronica oetaea*, a critically endangered local endemic of Mt. Oiti; Alyssum gustavsonii, endemic to Mt. Oiti and nearby Mt. Parnassos; and Polygonum papillosum, endemic to Mt. Oiti and Mt. Kallidromo. There is also a significant number of protected taxa, 67 in total, including 19 orchid taxa protected by the CITES. Veronica oetaea*, an Annex II Dir. 92/43/EEC priority species, is also protected by the Bern Convention. Two plants, Ruscus aculeatus and Gentiana lutea are included in Annex V of the abovementioned directive. Bird Fauna: The site is an Important Bird Area and a designated Special Protection Area for Birds. It hosts 21 Annex I Dir. 79/409/EEC bird species (13 resident and 6 breeding) and at least 32 migratory bird species. Ten of the bird species are threatened at the national level. The fact that 8 woodpecker species occur in the site indicates the presence of forests with a variety of structure, which is unusual in Central and Southern Greece. Mammal fauna: The site hosts 30 threatened species included in the Greek Red Data Book: 24 of them are protected by the Bern Convention (Annex II). Five resident species, the Chamois (Rupicapra rupicapra balcanica), the Geoffroy’s Bat (Myotis emarginatai) and Barbastelle (Barbastella barbastellus), the Brown Bear, and the Wolf (Canis lupus*) are included in Annex II Dir. 92/43/EEC. Amphibian and reptile fauna: The site hosts 16 species protected by the Bern Convention (Annex II). The Alpine Newt is breeding here in larger number than in other mountains of Central and Southern Greece. Three species, the Yellow-bellied Toad, the Mediterranean Spur-thighed Tortoise (Testudo graeca), and the Hermann’s Tortoise (Eurotestudo hermanni) are included in Annex II Dir. 92/43/EEC. Invertebrate fauna: Twenty-one important species have been recorded up to now in the site, 12 of them endemic to Greece. Three species, Lycaeiodes argyrognomon, Plebejus pylaon, and Brenttis graeca, are classified as rare in Europe and 8 species are protected under national legislation (Presidential Decree 67/81).